My latest PopMatters article, or in this case interview, is now live: Digital Relief: An Interview with GameSave. Most of my energy here at EXP is spent writing about "normal" games, be they mainstream or indie. However, most of my academic efforts are spent thinking and writing about social impact games. In fact, this time next week I will be starting an internship with Games for Change in New York and hopefully garnering an interesting perspective into the educational and persuasive games industry. Like my interviewees Annie Wright and Willow Brugh, I take the world-changing potential of games for granted. I am far more interested in how games can engender positive change than in the great "art debate." As Annie makes clear in the interview, games can fill many niches and satisfy many needs. 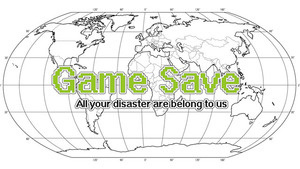 GameSave is one attempt, among others, to respond to global crises with modern media. While the event's conclusion is almost two months away, I trust the outcome will be worthy of all our attention. In regards to the types of GameSave creations I might find personally interesting, I would be fascinated by games that model many of the problems prevalent within modern systems of aid and development. The aid industry is burdened with a slew of problems, from inefficiencies and corruption, to systems of dependency and paternalistic relationships. The aid world is also deeply competitive, with organizations scrambling to secure donor funding and prove their worth. Of course the games that will come out of GameSave will likely address a variety of relief issues and pass some of these concerns up for more pressing matters. Disaster scenarios, be they man-made or otherwise, are ripe with systems waiting to be explored and understood through a gaming lens. GameSave has plenty of room to grow.